I have a 2006 Honda Accord that is due for the 90k maintenance. My question is, is it necessary to take the car to the dealer for this maintenance. I don't have a warranty at this point and wanted to see if there was any real reason to pay the extra cash instead of going to a Pep Boys or another mechanic. It is not necessary to take the car to the dealer for maintenance. 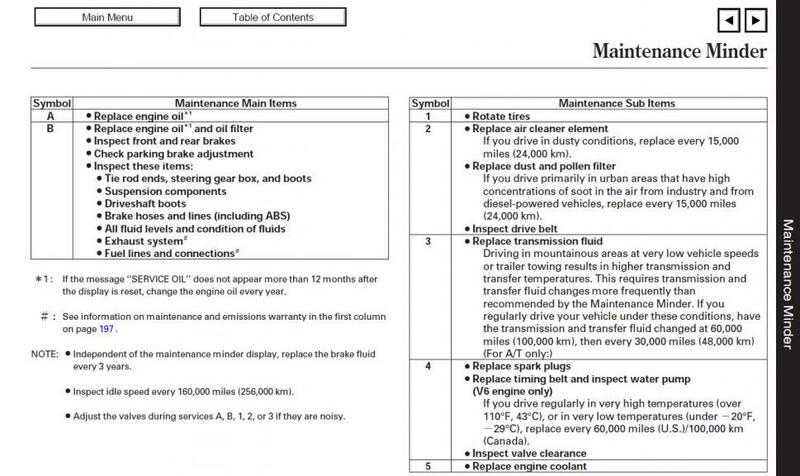 Your owner' manual has the service information regarding recommended items to check and/or replace. It is a 4 cylinder 2006 Accord. Sorry for not specifying earlier. all the factory service is basically an oil change, rotate tires, cabin air filter if it's dirty, engine air filter if needed and inspect the drive belt, hoses, brakes, fluids, yada yada...for grins and giggles you could even through in some spark plugs if you'd like, or wait till the 110k service. The 2006 Accord was when Honda added the maintenance minder; so, technically, there isn't a 90K maintenance like earlier Hondas. If your car is an automatic, I recommend changing the ATF fluid at least every 30,000 miles regardless of any maintenance minder. Honda's automatics sometimes are problematic.